Easy Gluten Free Recipes and Techniques: Free Ebook! Easy gluten free recipes can really come in handy when you’re pressed for time and need a quick meal or snack. 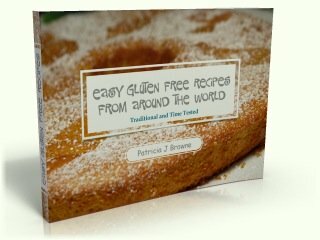 I’ve been gluten free for over 25 years and have gathered quite a collection of gluten free recipes from around the world, many of which are really easy. I put some of the most mouth-watering easy recipes together into a FREE eBook, to share them with you and help make your life a little easier. And hopefully more fun too. Sign up for my free monthly e-zine and you will be able to download my free e-book as soon as you confirm your subscription. Just fill in your info below, check your email for the confirmation email, and click the link to confirm it. You will be taken to a page with a download link and instructions for how to download Easy Gluten Free Recipes from Around The World. Your email is totally secure. I will never share it, and I will only use it to send you my monthly e-zine: The Gluten Free Nomad. Subscribe to my e-zine for free and receive FREE Gluten-Free Recipes! only to send you The Gluten Free Nomad. And don’t worry, it’s definitely free–I won’t be sending you tons of special offers or any kind of spam. Just updates to Gluten-Free-Around-the-World.com. Have Any Comments About the eBook? Let others know how you like (or don't like) the eBook in case they are deciding whether to subscribe. And I would love to know what you think about it so I can improve future books. Awesome book! I love the dedication and layout, and the recipes look great. I think my children may enjoy some for their lunches. Great work, Pat!